Greg Kolodziejzyk hopes to become the first person to travel from Canada to Hawaii under his own power using a custom-designed, state-of-the-art pedal-powered boat. The 3000 mile journey, from Victoria, B.C. to Honolulu, Hawaii, is expected to take between 50 to 80 days. Greg's epic human powered boat world-first adventure will begin June 1st, 2010. Greg Kolodziejzyk wants to add another world record to his heady list of accomplishments! He's hoping to become the first-ever person to travel from Canada to Hawaii under his own power - using a custom-designed, state-of-the-art pedal-powered boat christened "WiTHiN". The 3000 mile journey, from Victoria, B.C. to Honolulu, Hawaii, is expected to take between 50 to 80 days. Greg's epic adventure will begin June 1st, 2010. "This will be the most difficult record attempt I have ever undertaken," says Kolodziejzyk, who has previously set two human-powered world records (on land and water). "I will be facing one of the most formidable environments on the planet, pedaling for up to 16 hours per day, enduring storms at sea, and quite possibly even a capsize or two. It is going to be the ultimate test of my resolve." The Pedal The Ocean project began 3 years ago. Greg's original objective was an Atlantic crossing from the Canary Islands to the West Indies. When those plans were thwarted by logistical problems, he made the decision to attempt an even more ambitious self-propelled journey, from British Columbia to Hawaii. Greg's reason for this arduous journey is about more than simply setting another record. "My objective is to demonstrate the amazing things a human being can do under his or her own power. I hope to motivate and inspire more people to explore their own human-powered potential. It's good for the environment, it's essential for our health, and sends the right message regarding physical activity to our children". Kolodziejzyk has teamed up with Kimberlee's Bikes for Kids for the Pedal The Ocean record attempt. Each mile of the journey can be sponsored ($50) and for every mile Greg pedals WiTHiN across the Pacific ocean, the charity will donate one bicycle to a kid who can't afford one. If he makes it all the way to Hawaii it could mean 3000 bikes for 3000 kids. "Greg Kolodziejzk is trying to accomplish an amazing feat and we're so happy that he is taking Kimberlee's Bikes for Kids along with him," says Dan Gindling, president of Kimberlee's Bikes for Kids, a non-profit foundation that helps underprivileged children realize their dream of owning a new bicycle. "His fundraising efforts for KBK will put 3,000 smiles on 3,000 kids faces as they receive their new bikes. The world needs more people like Greg." You can follow Greg's progress at PedalTheOcean.com where he will be transmitting daily progress reports including video, photos, and live position feeds on the LIVE "Follow Greg" map. Greg Kolodziejzyk is a successful entrepreneur who informally retired from the business world when he was in his mid-30s to focus on improving his health and meeting new challenges. He started by signing up to compete in a triathlon, and then went on to complete 12 Ironman distance triathlons, with a 4th place finish in his division at Ironman Arizona in 2006 earning him a coveted slot to compete at the Ironman World Championships in Kona Hawaii. Greg has also completed a dozen marathons and 2 ultra-marathons. He is currently training to complete his first 100-mile ultra-marathon. No person in history has traveled further under his own power in one day, on land or water than Greg. In July of 2006, Greg earned his first world record by pedaling his human powered vehicle called Critical Power 647 miles (1041 km) in one day around a race track in Eureka, California. 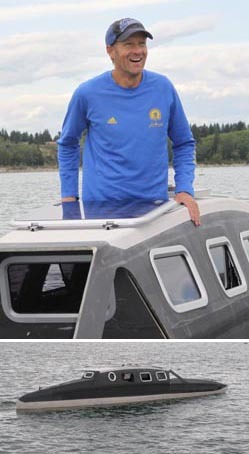 In September of 2008, he did it again, but this time on water when he pedaled his human powered boat Critical Power Two 152.3 miles (245.16 km) in 24 hours around a circular lake course in Whitefish, Montana earning him his second world record. Greg has been featured in the Guinness Book of World Records, Men's Journal magazine, Popular Science magazine, and on the Discovery Channel. Greg's state-of-the-art human powered boat was based on his own design. After building a test boat and conducting two successful rounds of sea trials, Greg hired award winning naval architect Stuart Bloomfield and human-powered boat engineer Rick Willoughby to design an expedition boat based on the test boat for the actual ocean crossing. What resulted is a one of a kind, human powered technical marvel. WiTHiN is arguably one of the most energy efficient human powered boats on the planet measuring 30 feet long by 3 feet wide, weighing 455 lbs, and featuring a wave piercing hull, a water-tight sleeping cabin, cockpit, and two storage compartments. WiTHiN will carry enough dehydrated food for 100 days at sea. Fresh water will be supplied via electric desalination plant powered by solar panels and a wind generator. Greg's safety equipment includes a GPS, Satellite phone, survival suit, emergency life raft, and emergency beacons. Greg is a successful and inspiring motivational speaker. Greg's motivational speech entitled "Bold!" is an entertaining look at the kind of attitude it takes to realize a dream, based upon the immortal words of German Poet Johann Wolfgang Von Goethe: "What you can do, or dream you can do, begin it, for Boldness has genius, power and magic in it." Greg lives in Southern Alberta with his business partner, training partner, best friend and wife Helen, and their two teenaged kids Cody and Krista. He is currently training for a 100 mile ultramarathon and the ocean crossing.